Sam and Dave go on a mission to find something very important. So they start digging… and they dig… and they dig.. but what will they find? Mr Tiger is bored of being sensible. He’s bored of tea parties and top hats and talking about the weather. Mr Tiger wants to go wild! But what about Mr Tiger’s friends? Will they stay sensible or will they go wild? Never mind Storm Doris! We can go on a bear hunt whenever we want! We’re going to catch a big one! What a beautiful day! Of course you shouldn’t let the pigeon drive the bus! Everybody knows that! But boy oh boy is that pigeon going to try! A classic read for older bookworms, Paddington has become a household name, but do you know the story of how he first came to be found in a London train station? The great hat saga continues from I Want My Hat Back. Fin d out what happens to the tiny fish in the little blue hat when he meets the enormous fish who won’t wake up. And it doesn’t stop there! In the latest hat kerfuffle two turtles find a mysterious hat. It looks good on both of them, but who gets to keep it? Three cats are very hungry, they want some fish, so naturally, they steal a penguin to catch some for them. How will the penguin escape? And what will happen to the hungry cats? The crayons need to be rescued! They’ve been trapped down the side of the sofa, sat on by dad and even melted into one of Duncan’s socks. How on earth will they be saved? We might be a bit biased but we LOVE this anthology. Published by The Reader, A Little, Aloud For Children is designed to be read aloud so families can enjoy storytime together. With lots of stories and poems to choose from, there’s something for everybody with favourites from authors such as David Almond, Frank Cottrell Boyce, Shaun Tan and Neil Gaiman, Joan Aiken , Roald Dahl and E. Nesbit, as well as bite-size snippets from Shakespeare, Kipling and Dickens. 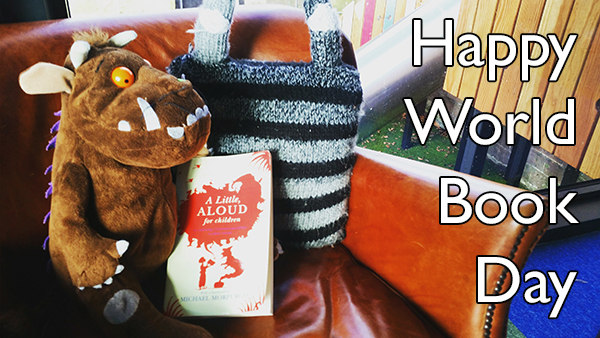 You can order a copy of A Little, Aloud For Children on The Reader website. You can enjoy all these stories and more at our exciting storytime sessions at The Storybarn where we bring books to life and create masterpiece crafts, enjoy imaginative games and whizz down our giant slide! Find out more on The Storybarn website.